Dear judges of wooden houses! 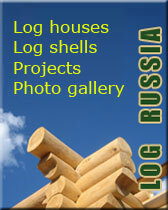 The building company "Log Russia" is glad to see you on pages of our web site. The office and the building site of our company are located in the city of St.-Petersburg in the North-west of Russia, at 2 o'clock driving from Finland. пїЅ To provide convenience of visiting of our company to our European customers and partners. All these factors allow the company "Log Russia" to keep competitive prices on wooden homes and bathhouses, at maintenance of high quality of production. Unfortunately, few building companies from Russia can provide application of labour-consuming and hi-tech approaches at manufacturing of wooden houses. We will note only a number of technologies: use of a dowel and special notch in the Canadian bowl, curtaining of external corners of house, use of the zinced metal couplers for face connection of logs, etc. Experts of our company have long-term experience of cooperation with customers from countries of Scandinavia (first of all Norway), Germany and other countries of Western Europe. 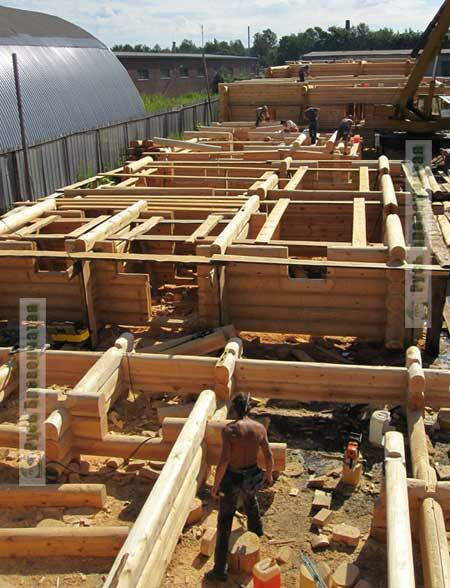 Working with them, we always try to adopt all the best that exists in world experience of building of wooden houses. Therefore now our carpenters apply the best technologies of wooden house building (in more details about it You can read here). 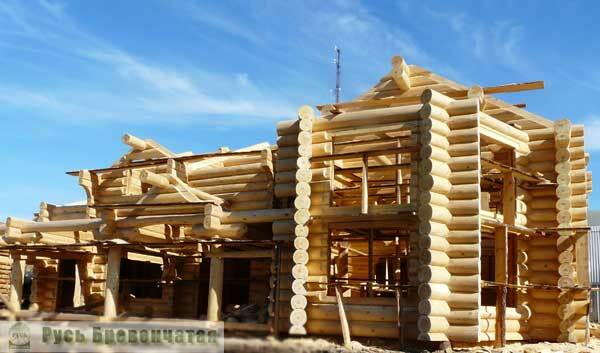 The basic specialization of our company is designing and manufacturing of handcrafted log shells of wooden houses with the subsequent installation of it on the territory of customer. We also offer this service to our foreign customers. We invite dealers from various regions of Europe to cooperation. Besides, you can order wooden pavilions, wooden decorations in form of volume and flat figures (examples of our works are resulted here). In the Russian market we are ready to build houses "on a turn-key", including base building, roof erection, internal furnish of the house and making of engineering communications. Also we make a laying of furnaces and fireplaces of any complexity. The company "Log Russia" not only builds high quality wooden houses, but also tries to popularize modern technologies of wooden house building among other building companies and the future clients. We actively co-operate with well-known Russian magazines about country housing: " Land owner. Countryside building", "Wooden houses", etc. We have already published more than ten articles devoted to manufacturing of houses, and also to accompanying works: to base and cellar creation, building of a roof and engineering networks. Some of our publications are presented in "Article" section. Let's stop on our production more detailed. Material for building of wooden houses and baths is wood of coniferous breeds ( a pine, a fur-tree, a larch ), brought from northern areas of Russia. We build houses of a round log (diameter of logs from 26 cm) and an oval-flatten (a semioval log in the thickness of 20 cm or 25 cm), use of logs of non-standard length (7-12) is also possible. In addition to it our company offers you shells from "winter" wood. We conduct preparation of a stock of wood during the winter period when the least quantity of a moisture is in wood and it is has less shrinkage, rotting, hogging and cracks. Use of "winter" wood at building of the wooden house essentially reduces its shrinkage term and allows to start full furnish earlier. 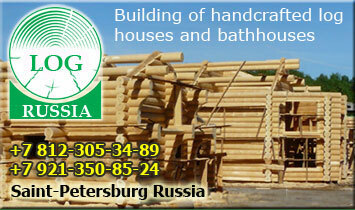 The company "Log Russia" makes exclusively HANDCRAFTED log houses and baths. Such way of building and processing of logs is more expensive and labour-consuming. However at more fine manual work, in difference with industrial milled round logs, the wood structure is not broken, the top protective layer of a log that is pledge of durability of your house or a bath practically is not damaged. Additional plus is that the walls made of logs pared down by a manual electroplane, do not demand the further furnish. The company "Log Russia" represents to your attention completely ready to application timbered shell at which pediments are cut accurately off, interfloor beams and poles for roof installation are made. And also: all door and window apertures are sawn through under the size of joiner's products, saw cuts under a cranial beam to which windows and doors fasten are also made. 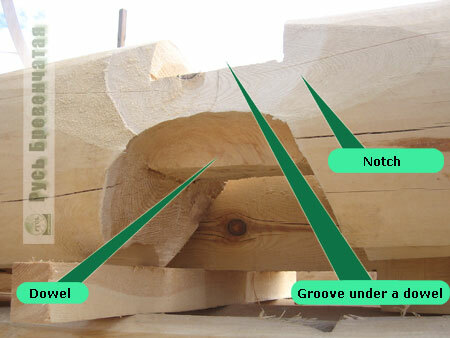 Moreover, on logs it is made a saw cut for removal of pressure, and lateral notches, allowing to keep ideal density of connection. Various technologies of building can be used according to your desire: Norwegian, Canadian or Russian. Wooden houses are cut on territories of our building site that provides supervision over quality of works and a material, accurate observance of technology of building. Thus the client completely supervises all process of building - from the beginning of building of the house till its delivery. After signing of the certificate of reception-transfer of shell, it is disassembled and delivered to a place of assemblage by motor transport. 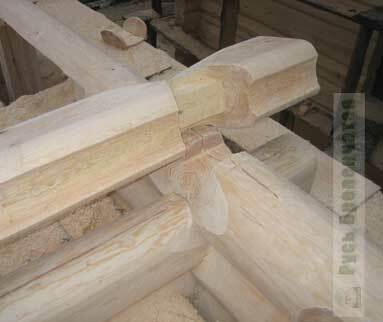 Assemblage of a log shell is carried out by experts of our company that guarantees its quality and reliability.